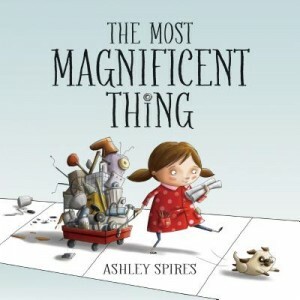 Right from the opening lines, you fall in love with this nameless little girl and her best friend, a very quirky looking dog, who you can barely tell is a dog… But this illustrated children’s book is not about the dog so much, but about perseverance. This is a message book, certainly, but a message that is totally sugar coated. The message – don’t give up! The illustrations are very contemporary, almost cartoonish, but somehow, they work. The setting is a city, which also works. And the ending of this children’s book ‘s pure delight, as we don’t know until the end exactly what this little girl is trying so hard to build. In the middle, the drama reaches a climax with an all too-familiar temper tantrum, beautifully supported with few words, and terrific illustrations. There’s no child who could read this without feeling they’d been there too! Lovely children’s book for today’s children. Created by a Canadian, somewhat educational, children’s book publisher, Kids Can Press.